Feel the allure of Russia as you drive past whitewashed walls of once-fortified cities, their golden spires and onion domes marking the horizon as bells ring out from soaring belfries announcing long ago tales. 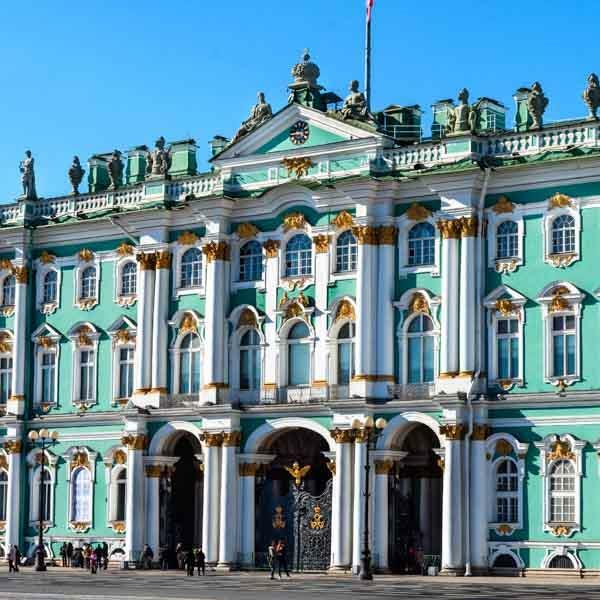 Immerse yourself in the land of the czars, revolutionaries, dissidents, vodka and caviar on this private tour of Russia. Experience the legendary history, majestic art, captivating culture and architectural treasures that make it one of the world’s most fascinating countries. In the evenings, relax in well-appointed accommodations that offer first-rate service and exceptional style. While in Moscow, your private guide will lead you around the signature city sights, offering insight as you discover the imposing fortifications of the Kremlin, Red Square, the opulent Saint Basil's Cathedral, and more. Continue to the famed Golden Ring, northeast of Moscow. The ancient towns which form the Ring all host unique architecture and monuments from the 12th-18th centuries, and were critical in the formation of the renowned Russian Orthodox Church. Take the high speed Sapsan train to St. Petersburg to see the Hermitage Museum boasting works of art for da Vinci, Michelangelo and Picasso, and discover St. Peter and Paul’s Fortress, St. Isaac's Cathedral, and the stunning Peterhof Palace, with its pristine gardens and gilded statue-lined fountains. This exceptional journey will be one you won’t soon forget.